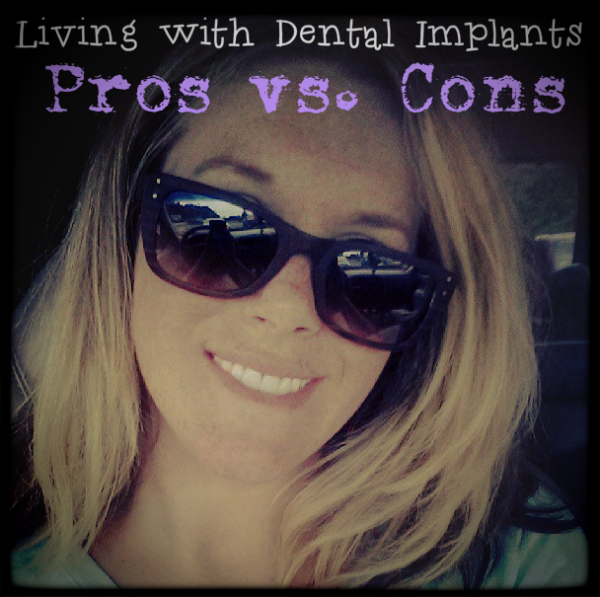 Living with Dental Implants: Pros vs. Cons | iweardentures! Ok, so take into consideration the fact that I have only had implants since March. Also, this list is more personal than it is “technical”. I am no expert. This is just my day-to-day pros vs. cons in living with dental implants. I don’t have to take them out, which makes me feel VERY safe and secure, as well as the fact that it returns some sense of normalcy to my life. They are extremely stable, which makes eating an absolute breeze. Apples? Yes please! They stabilize my bone. The bone integrates with the implants through a process called osseointegration. This gives the bone something to stick around for. There is nothing covering my palate. This not only makes eating more enjoyable, but it just feels more natural. I absolutely love being able smile in the mirror, inspect my teeth, and clean them without removing them. I love brushing them. It just feels nice. If an emergency situation were to come up, I could get out of Dodge, rather than fumbling around looking for my teeth LOL! Cleaning them can sort of slow me down at times. There are a lot of steps involved in making sure i’ve removed every trace of food under the bridges. Speaking of which, food gets under the bridges. If the food is left too long, it can cause your gums to become irritated. I’ve yet to have them cleaned professionally but it’s looming over my head…. and i’m sure it’s probably pretty expensive. If a problem were to arise, i’m sure that would be expensive, alsoâ€”such as fixing (or replacing) a bridge or implant. Overall, the pros far outweigh the cons and that is what matters. I am very happy with my implants. There are many different systems of placing implants so you would have to do your research and determine which will suit you best. But for me, these are perfect. I think you looked beautiful with dentures and you also do with implants. I am about to get dentures. In my perfect world I would get implants but that is not realistic for me. I wonder if I won implants in a contest, would I take them? I say that only because my finances dont allow for what it would require to replace bridges or implants …however I still think I would accept the implants and worry about all that later as it arises. Does this concern you? Did you also win upkeep for life? And if not, do you have a plan or just taking it as it comes? I want you to know you have inspired me to finally do this! You are a beautiful person, inside and out! Congrats!!!!! I'm wondering if implant supported removable dentures would be a good alternative to both? They are more secure than regular dentures, the palate isn't covered, snap-in and stay in without worry of falling out, if/when food gets stuck under them just snap them out to clean them and your gums real good and then snap them back in. Yes its a real time experience to know something about implants and dentures pros vs. cons. You look good with a smile. Take care to clean your implants in daily routines. To fix implants it cost, some may not afford that much. The easy way is to pay with insurance. Hope you can follow me here. Wondering how can implants be cleaned, as you suggested, if the arch is fixed and non removable? I have dental implants. In starting it was a little bit uncomfortable. I was also suffering with sensitivity problem. But now it is good even this is really hard to recognize that which tooth is implanted. I am really thankful of Seapoint dental implants. They charged so less. I might have to get dental implants soon. Thanks for letting me know what I'll be getting into? How was the whole procedure? I believe it takes time just for the crown to be installed. But no doubt you had a very successful surgery. You now got a killer smile! I had a Dr. in PA do a full mouth dental implant procedure. The procedure was gory and I almost died from complications post surgery. This Dr. also damaged the nerves in the front of my face. My life is a living hell and and the quality of my life has diminished 80%. The rest of my life I have to live feeling like I have been punched in the face. After paying this Dr. $100,000 I am now paying another Dr. another $100,000 to try and correct what the first Dr. did to me. There is nothing that can be done about the damage to my facial nerves. I DO NOT RECOMMEND DENTAL IMPLANTS. THEY RUINED MY LIFE !!!!!!! How long does it take to pull teeth to prepare for dentures? That is really a great thing. Thank you! The treatment of dental implant is helping a lot to regain the lost teeth of a person, as well as it is also helping to eat, speak, laugh easily. A friend of mine, recently undergone a treatment of dental implant from, BocaJawSurgery.com. She suggested me too to visit the website, as they are providing the service of dental implant and oral surgery to patients. After being involved with dental implants for over 20 years, I still find it amazing how people think that once they get dental implants they donâ€™t even need to see the dentist any longer. Yes, That is the great news that you are living with the dental implants. Who are thinking about the dental treatment on the dental implants he/she mus take the positive steps for living with dental implants. With these edges, people will improve their oral health which will additionally facilitate them build their appearance and look higher. Click here for additional, for more information click here cosmetic dentist wantagh. I am very happy to know this discussion because you said that you have told me that you Living with Dental Implants which is very important for me as well. keep it up. I am looking at needing dental implants in the near future. It is really nice to read a pro and con list of how to care for the implants. The part that makes me worried is the part of cleaning my gums extra well. That would be bad to not get my gums clean enough and then things start to smell or get infected. Hi everyone. I just want to say thank you Kristi, you inspired me so much. I’m 33 years old, had numerous cyst attached to a couple of my roots. I had terrible teeth. Finally I got them all removed. I am picking up my dentures tomorrow, I love the look of them! Now for anyone else reading this, there is an other option in between, called mini implants, which hold your existing dentures in place. That is what I am getting, it’s a lot cheaper than regular implants, your dentures snap on to them, if you ever need to change dentures you just get a new set, you don’t have to pay a ton for those bridges, and it still helps to keep the bone structure just like regular implants. And if they are kept clean, they can also last a lifetime! I will get those in December. Thank you Kristi for giving me hope when I felt the lowest in my life. And one more thing, as a mother I should say please other moms, read the book Cure Tooth Decay from Ramiel Nagel. You can strengthen your kids’ teeth, don’t believe it’s genetics and you can’t do nothing about it. Why do you have to clean implants/dentures? They are not real. Thinking about this. Can this be done if one has osteoporosis? Can you have just top denture done and not bottom? These are non-removable, right? Why would it be expensive to have cleaned, the dentist can remove them? Why are bridges mentioned? Does anyone know the cost of getting the implants cleaned and if it’s hard to find a dentist that will do it? I am facing removal if the few teeth I have left, clean out of infection, and mini implants for snap on dentures. They sounded pretty OK at first but now I’m told the bottom teeth will rock slightly (NOT OK for me) and I will only be able to eat things that can be cut with a fork. I has thought he was referring to the temp dentures I’d wear while healing but no, it’s for good. He said people also have trouble with lettuce/salads. I’ve worked to bring my diabetes under control to gave this done, and I’m spending 30,000, which to me is way too expensive for ‘just ok’ results. I’d like to look into fixed bridges. Has anyone had experience with those? Dolly please let us know how the snap on dentures work for you and any cons. Thank you! How can you clean your implants if you just cannot take them out as you used to with the dentures? Do they really get cleaned well and which product do you use for it? False teeth are plastics I guess so how can you avoid stainning and specially if you cannot take them out, might be a real nightmare I guess. I was wondering if anyone has the implant supported “snap in” dentures. I am looking at having that procedure but I don’t like that the bottoms will rock slightly and also I’m told I can eat anything that can be cut with a fork. So no steak, not even Subway sandwiches. I feel like for the $$$ I am spending I should be happier with the results. How easy is it to have bridges attached to implants? I’m glad to hear all worked out for you Kristi. Getting dental implants can be life changing and it’s amazing to see the positive change they can make. Like you, I would urge people to do their research when it comes to finding a reputable dentist to do the work. Yours look great so it’s proof that doing research does pay off. I am new, so forgive my ignorance…but are you saying she “won” the implants? I would probably do it if I won, or ever could afford it BUT, My dentist talked like my bone structure would not be good for it. sadness. crying for a while! lol. but..IF I could, I would! Will be interested in finding out how this has been since its a few years later now. Like to get other opinions. I sort of feel a sadness because now, you’re no longer truly a denture wearer. glad for you, but feel like we are no longer on the same team. :'( but, c’est la vie.